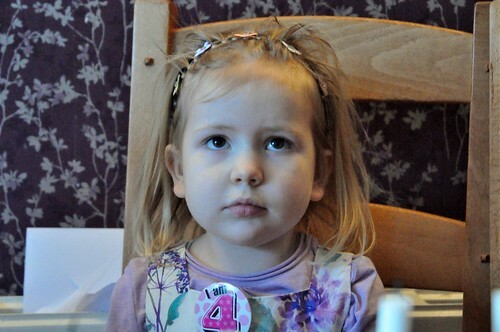 Amaia is 4, a photo by PhylB on Flickr. It's funny what you remember. One of my first memories is also of being four. Around my fourth birthday we went to visit my great granny. I remember her as a bothersome old biddy who smelled bad and intimidated everyone. An unwritten family rule was that no matter what she gave you for a birthday or Xmas had to be praised as your favourite gift and shown off proudly to all around. On my fourth birthday she handed me a card. I can still see it today - average in size with two cute pandas on the front and at the top a large purple '3'! I was insulted as only a four year old can be when handed a three-card. I refused to thank the old bat and I made a secret vow to myself to hate her till her dying day! She lived another ten years and I never felt any fondness for the woman again! Never cross a four year old!